IMPORTANT NOTICE: Most of the Classic cabinets were deleted by January 01, 2018. The only Classic cabinets left are the vertical F-10 (Microfiche) and the R-12 (Rollfilm). New lateral 36″ wide replacement cabinets will soon be available for microfiche and microfilm. Russ Bassett Corporation has built a reputation for providing high quality microfilm cabinets. The F Series (vertical) and FL Series (lateral) microfiche storage cabinets from Russ Bassett are designed to provide maximum filing density for your microfiche records. They are sensibly designed, user friendly and are built of heavy guage steel to provide years of trouble free service. The cabinets are quickly recognized by their center mounted, chrome flush drawer pull. 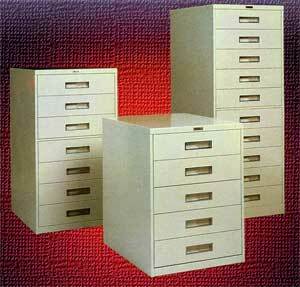 The full extension drawers assure easy acess to all microfiche. Both the F and FL series Russ Bassett microfiche storage cabinets come in three models, a five drawer desk height unit, a seven drawer counter height unit and a ten drawer full height unit. 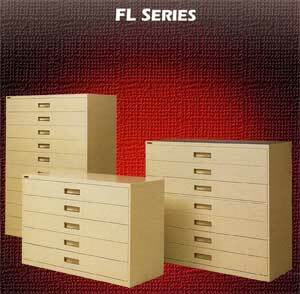 All FL-Series: 30 control plates per drawer standard. May substitute 6 mechanical compressors as no charge option.